Duck preserved in duck fat, confit de canard in French is one of the great delights of eating in south-western France. 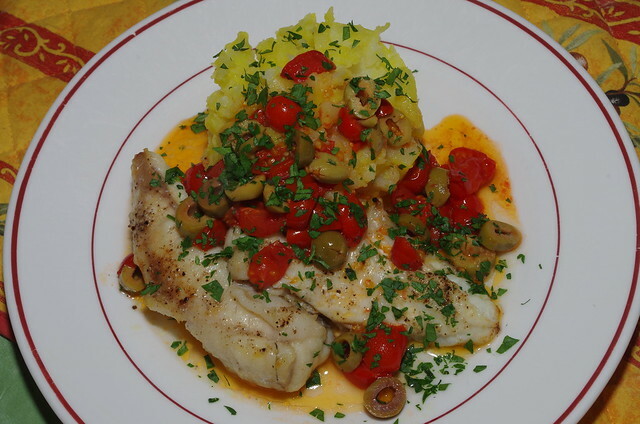 It is on pretty much all the menus in those parts and it is always a good reliable thing to order. 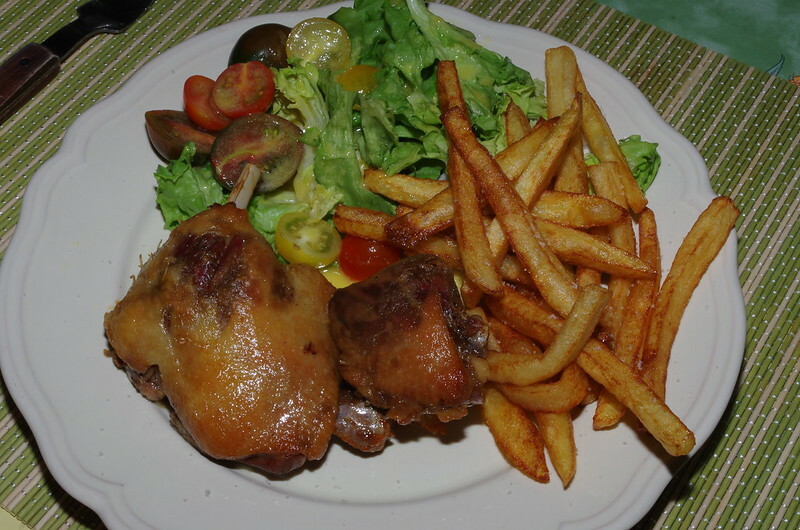 Duck confit is made from the legs and thighs of the duck, with the breasts being used as magret de canard and the rest of the meat ends up as rillettes or paté. The livers, of course are used for fois gras. 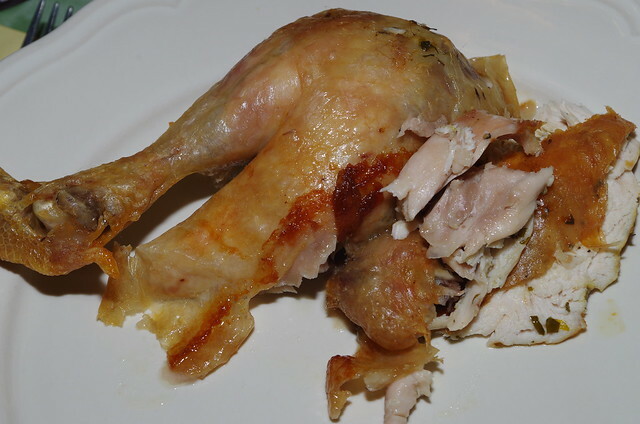 You can make confit yourself, in fact I’ve done it in the past, but in France the easiest thing is to just buy your confit, which is sold in tins almost everywhere in the region, as well as in supermarkets across France. I always stock up on tins of confit when I go to France. Confit is made by salting the duck and letting it rest, then cleaning off the salt and slowly cooking the duck legs in duck fat until they are very tender and the meat is rich and unctuous. Getting the duck ou tof the tin is a simple matter of warming the opened tin up in a bowl of boiling water to soften the duck fat in which the meat has been cooked and then taking the duck legs out with a spoon. 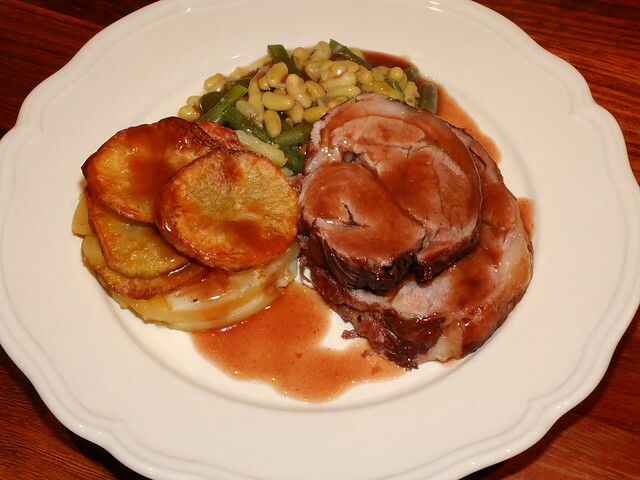 The meat will be incredibly soft and rich-tasting and comes easily away from the bones. There will also be the skin and sub-cutaneous fat as well. There are lots of things that you can do with confit, putting it in cassoulet, for example but the simplest is just heating it up in the oven or in a frying pan (I prefer the oven) and serving it with a simple salad, dressed with quite a sharp vinaigrette and some frites or maybe pommes Sarladaise, which are slices of waxy potato fried in duck fat until golden with garlic and parsley added towards the end of the cooking time. If you have any truffles, you can add these to the potatoes with the garlic. You want a local red wine to go with this; Bergerac is a pretty classic choice but any decent red Bordeaux will also go well. 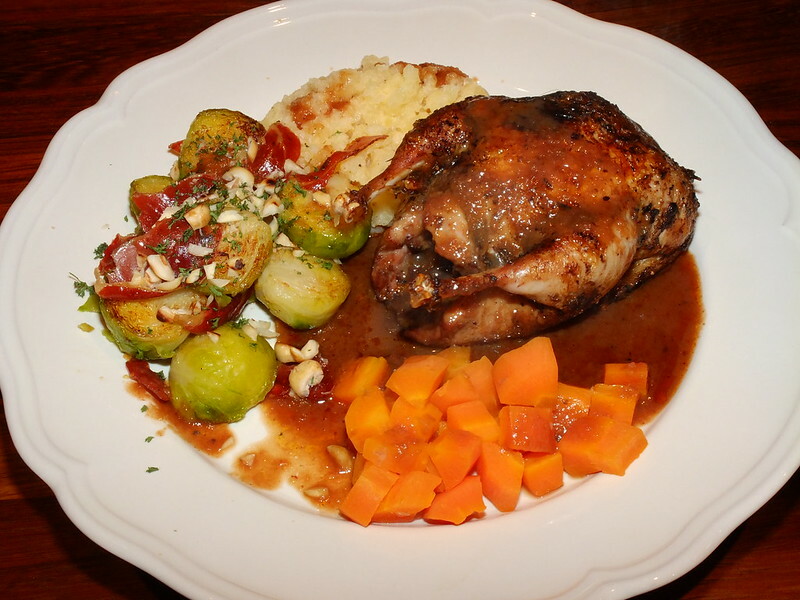 Chicken breast with chanterelles, a photo by La belle dame sans souci on Flickr. 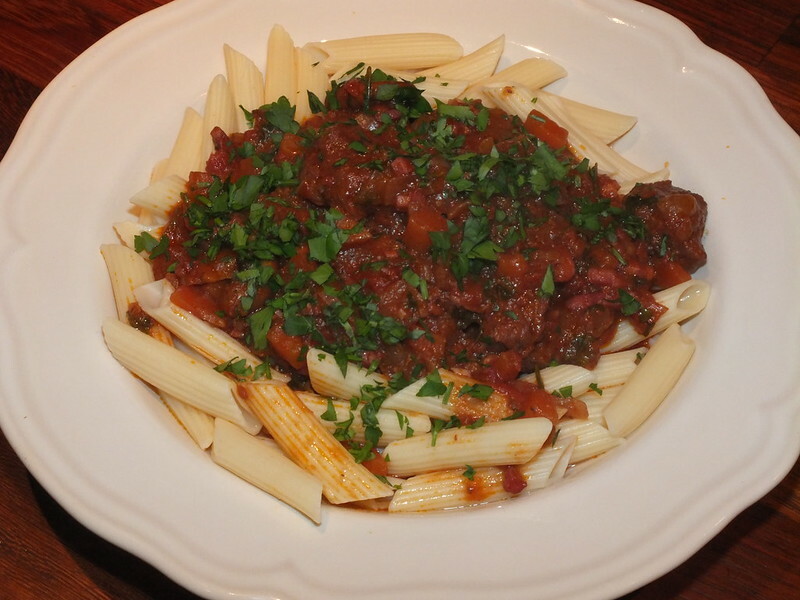 Another simple dish and a lovely Sunday evening dinner. Th chicken breast had a mixture of butter, crushed smoked garlic and salt pushed under the skin and was roasted for about 25 minutes. When this was done and resting, I sautéed some chanterelles (also called girolles) in butter and fresh thyme and then added some white wine and some of the roasting juices and reduced this down before adding two tablespoons of crème fraiche, allowing it to bubble and reduce slightly, checking the seasoning before serving. 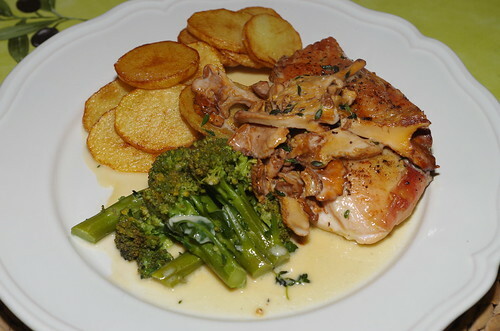 As the chicken and mushrooms were the stars here, the accompaniments were simple, sautéed potatoes and steamed broccoli. We had a nice bottle of wine with this; a Château La Maine, 2006 St Emilion Grande Cru, a nicely mature red Bordeaux.